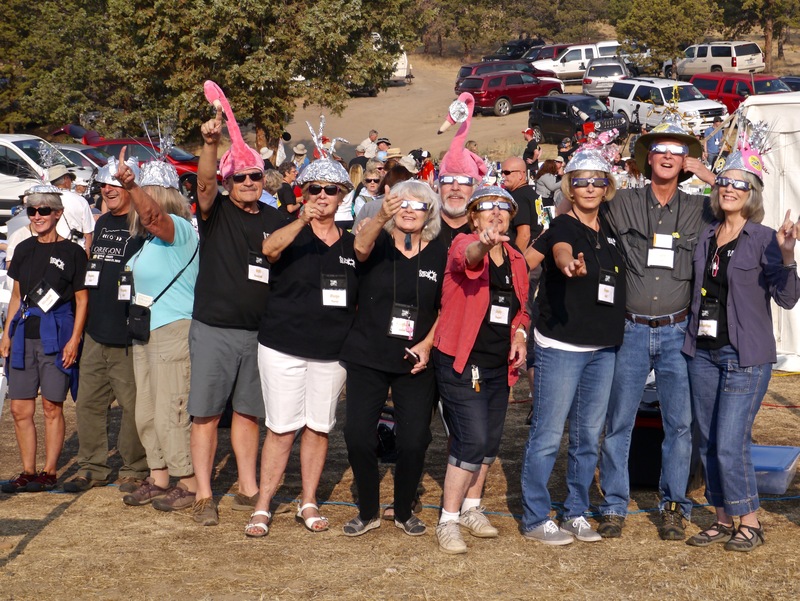 Several years ago when The Great American Eclipse hit my radar, I mentioned it to some of my fellow Oregon Airstream owners at a Wally Byam Caravan Club annual meeting. “Hey, you guys, we should have a big rally during the total eclipse of the sun that’s coming up!” I said. 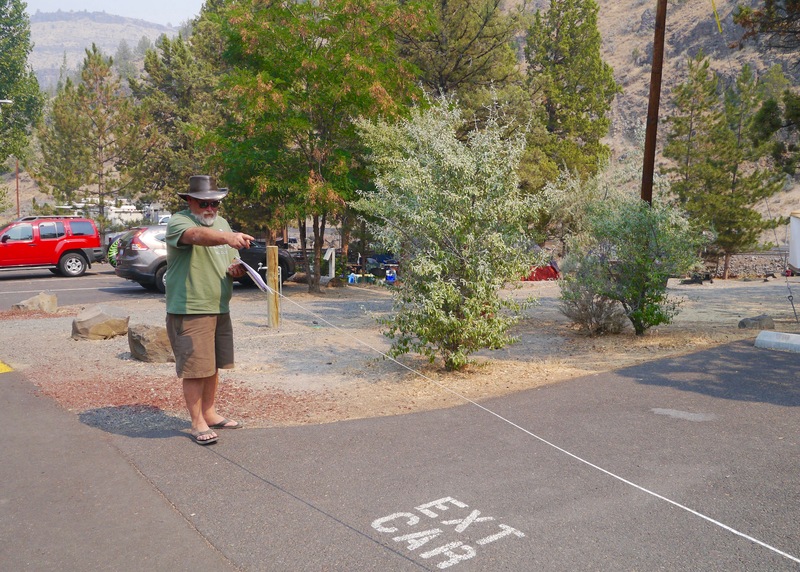 Down, girl, was the initial (and reasonable) reaction but when I brought it up again later it really was time to plan, and almost past time; many campsites and blocks of hotels in Central Oregon were already booked. 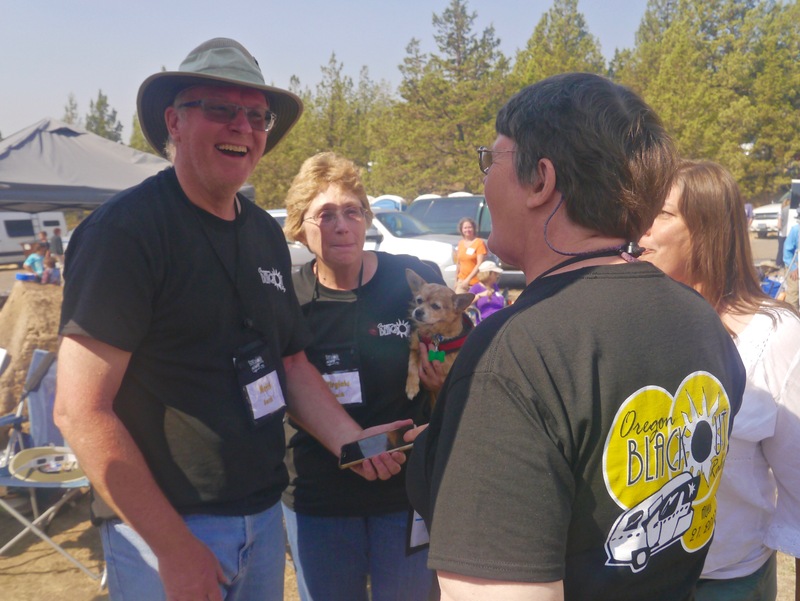 A team of co-hosts and rally volunteers stepped up to help organize the event, and we secured two campgrounds in a prime viewing location in Madras, Oregon. 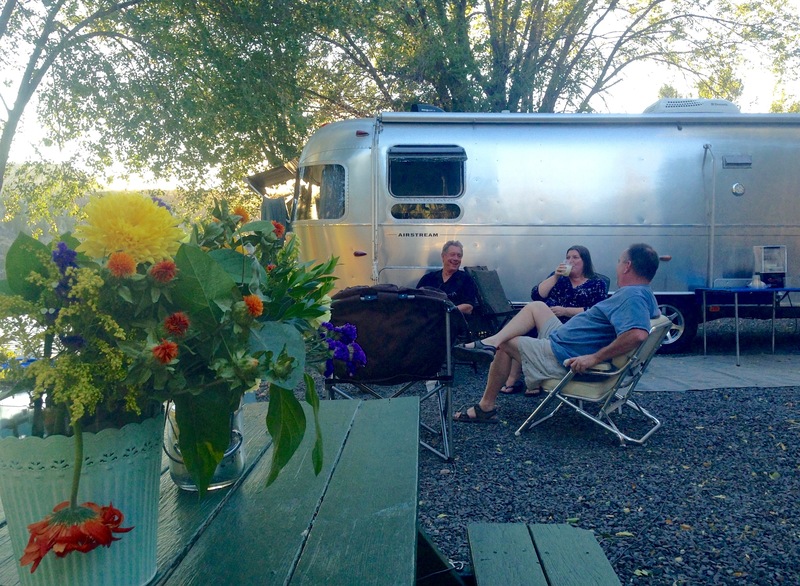 I know what you’re thinking—sorry, the Oregon Airstream Blackout Rally has been sold out for nearly two years. 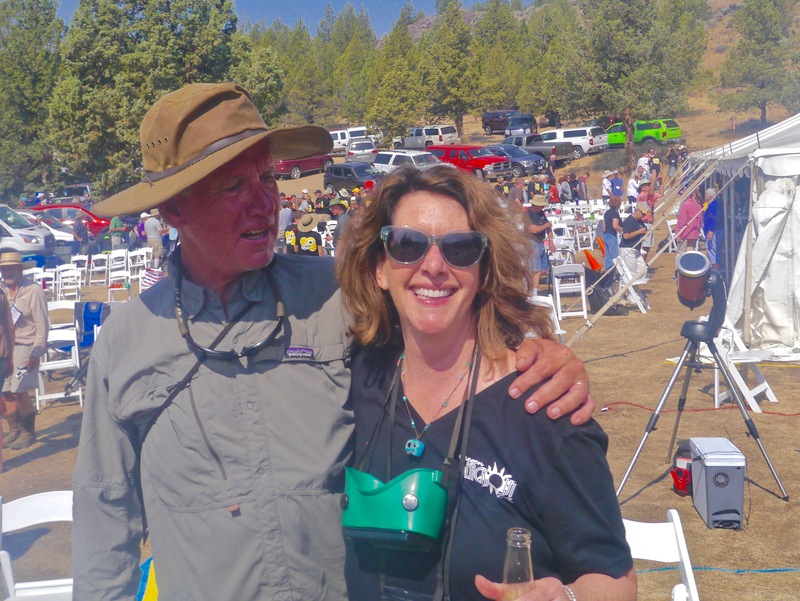 I never thought August 2017 would arrive, but here we are, and the Blackout Rally will be nothing short of epic: a weekend for 300 Airstreamers and their friends and families, packed with live entertainment, catered food, science presentations, star parties, a marina bash—and totality on the final day. We just have to get there (and hope the dire traffic predictions are Fake News), and cross our fingers and toes for clear skies. 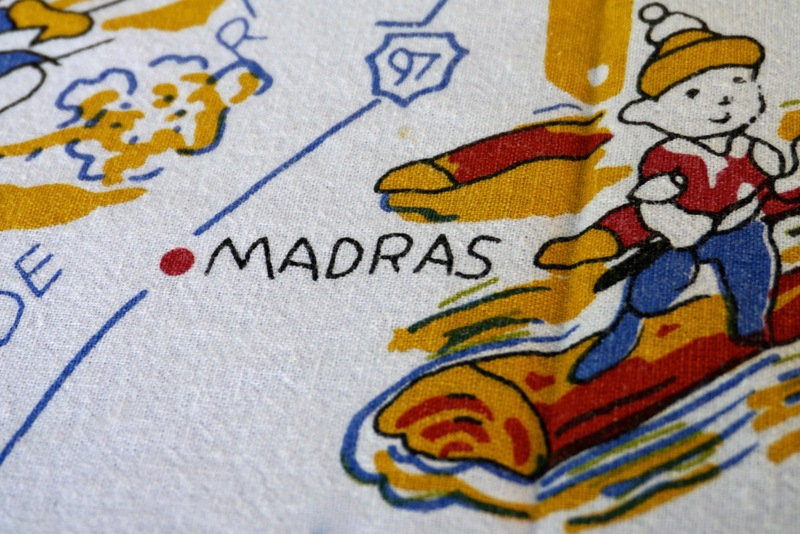 NASA and the Science Channel are placing their bets on Madras, as well: the location has a 95 to 98% chance of unobstructed viewing on August 21, and Accuweather is predicting 83° with “abundant sunshine”. 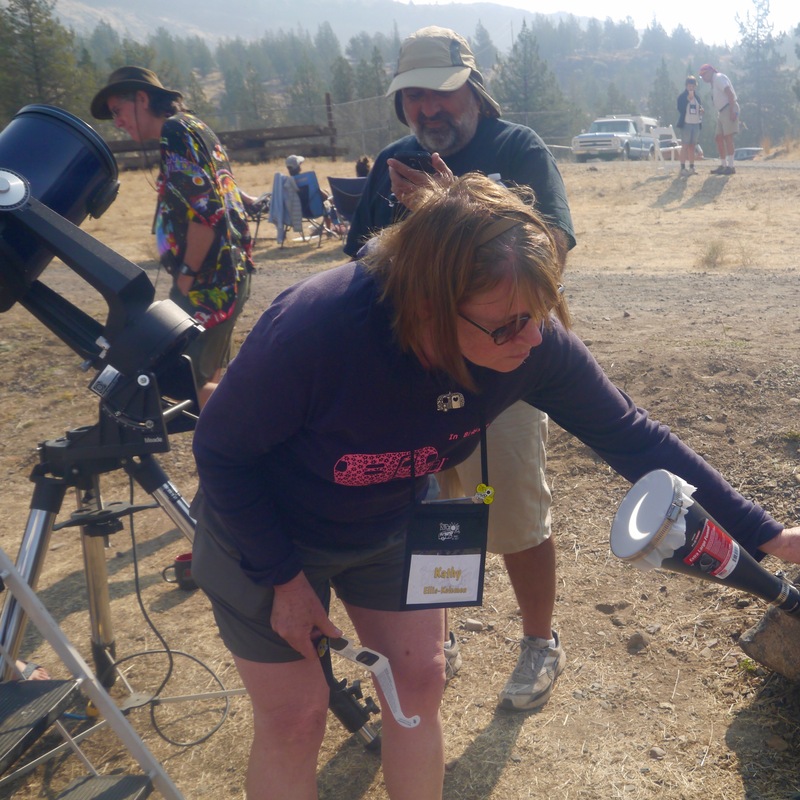 Review a collection of top eclipse articles and web posts on Tumblr at Second Contact. 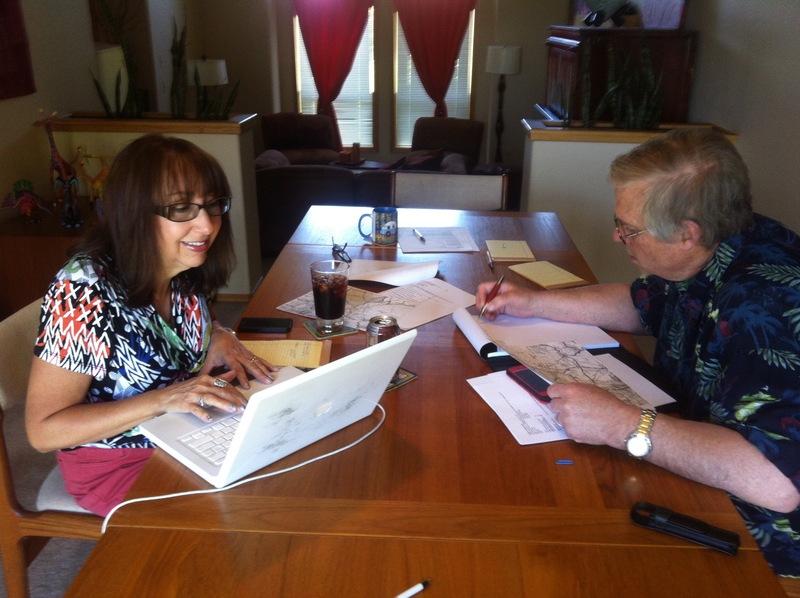 Below: Early planners review eclipse data; co-host plots the Airstream trailer sites; host huddle in the marina store; lakeside campsites; marina dock; Airstreamers on site last summer; Oregon eclipse path; lovely lake locale; grill guy tests eclipse glasses; sorry, sold out! Isn’t it too dark at night to see the eclipse? If the solar eclipse is so dangerous to look at, why are they having it? 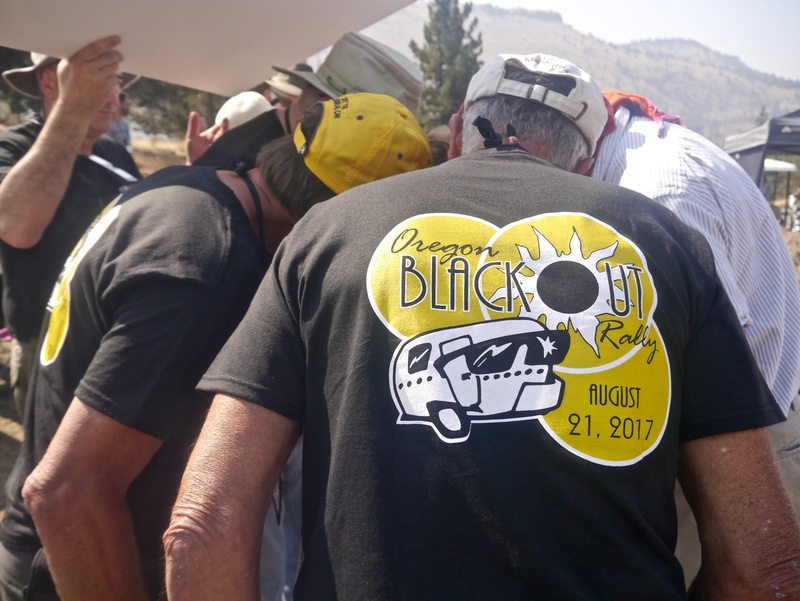 A real live astronomer will be a guest at the Oregon Airstream Blackout Rally, and will answer questions about the celestial event of the summer. What would you like to know but are embarrassed to ask? I’ll find out and report back. 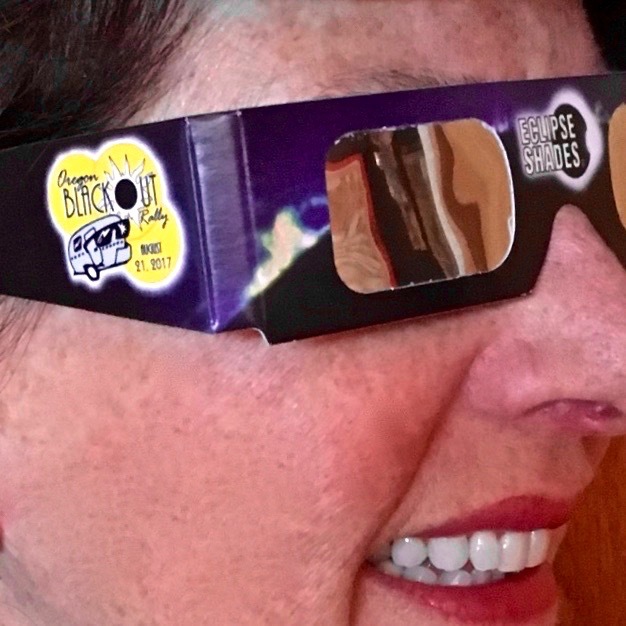 Ain’t no shame if you’re wondering if you’ll see the moon like it looks on the stamp, why the path travels from west to east, how you’ll be able to see totality with your eclipse glasses on, and why sunglasses won’t keep you from going blind. Does the size of the sun vary from one place to another? If someone in Australia took an unzoomed, unmagnified picture of the sun, would the area of the sun be equal to a photo taken, say, in Norway? I have no idea why this has any bearing on astrophotography, but okay. Hmm. Related: and I’m not too proud to say this out loud. How does the lunar eclipse path differ from the normal process of the phases of the moon? NO LAUGHING. Someone demonstrated this to me once using a lime, a lemon, and a tennis ball. It made sense then, but it didn’t stick. My favorite question—to which I’ve heard only unsatisfactory answers—is this: does a total eclipse take place on any other planet? Yes, two moons of Saturn in our own solar system might produce an extremely inferior version of what we experience on Earth—but to our knowledge there are no others. (“In the vastness of the universe certainly there must be” doesn’t count.) Now for the follow up question (chill, anti-intelligent designers): what are the odds? Earthlings rely on one sun and one moon—one is 400 times larger than the other, and the other is 400 times farther away—making their discs in the sky the same size, allowing for a total eclipse. Wait, there’s more: what are the continued odds that Earth is the only planet we know of on which sentient, self-aware beings reside, who are able to appreciate the spectacle? Mind blown. The multiple warnings about not looking directly at the sun seem peculiar. I mean, really? “Don’t look at the sun” is akin to “don’t hold your hand over a flame” or any other dangerous and painful act that would be ludicrous to do and impossible to sustain. Common sense dictates against such a practice (but judging from recent events in our culture, common sense is at a premium). I couldn’t help but wonder (Carrie Bradshaw style)…is this really a problem? Turns out it is. According to LiveScience.com, total blindness is rare, but you might be in danger of contracting “solar retinopathy”—aka photic retinopathy, foveomacular retinitis, solar retinitis, and eclipse retinopathy—resulting in temporary to permanent blurriness or a blind spot at the center of your vision. “Eclipse blindness” is caused when ultraviolet light overwhelms your retina, located at the back of your eye where the photosensing cells that allow you to see are located. 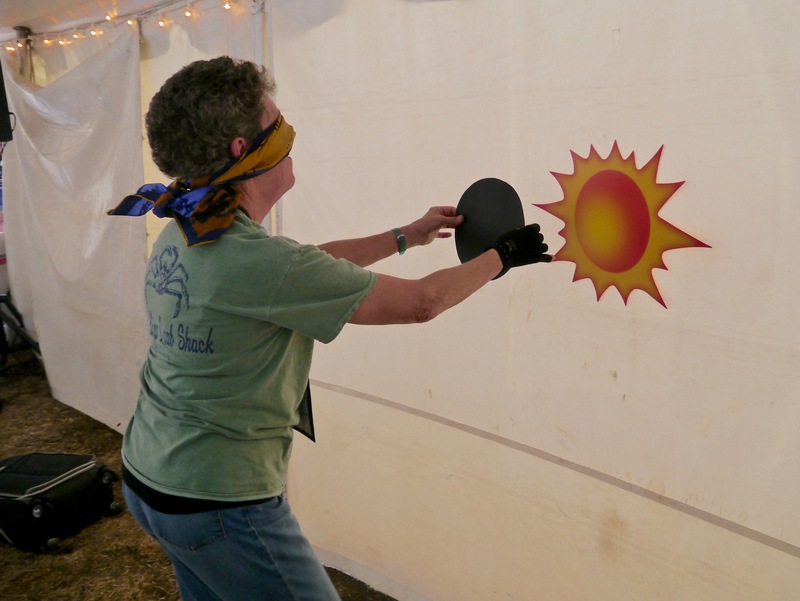 During the deep partial phases of the eclipse when sunlight dims it can be tempting to sneak a peek, and the damage at that point is delivered without pain and when protective reflexes (like blinking and pupil contraction) are slacking off. 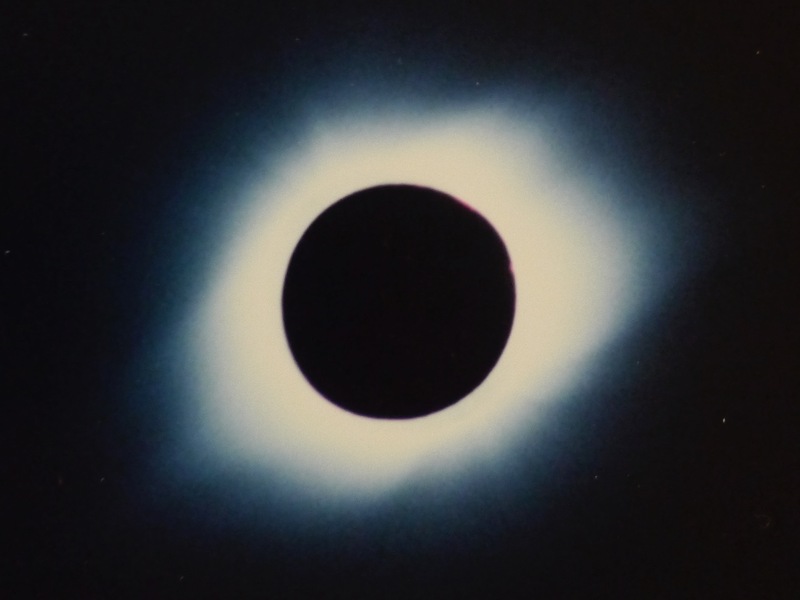 Solar retinopathy can occur at any point during the partial phase—including the final seconds before totality—and the most important reason to shield your eyes occurs in the very last two or three seconds before blackout: looking directly at the sun during this time can cause temporary vision distortion that can bork your enjoyment of the scant, precious minutes of totality. 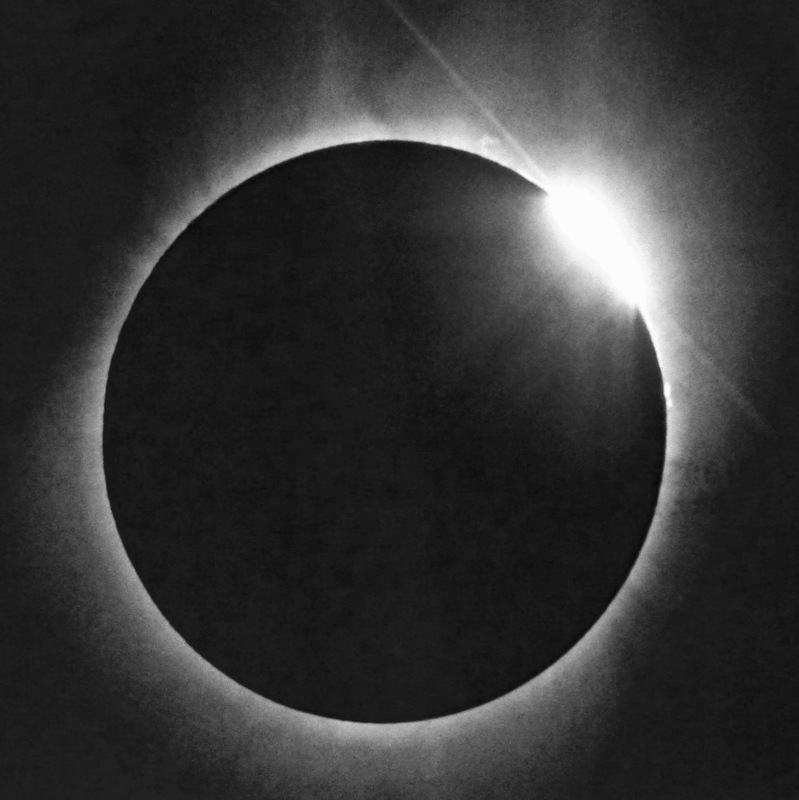 Many people don’t understand that you must look at the sun with the naked eye after Second Contact, and the trick for a first time eclipse viewer is to know when to whip those eclipse shades off in time to see the entry phenomenon like Bailey’s beads and the diamond ring. Stay calm, and keep your glasses on until you’re sure it’s safe. 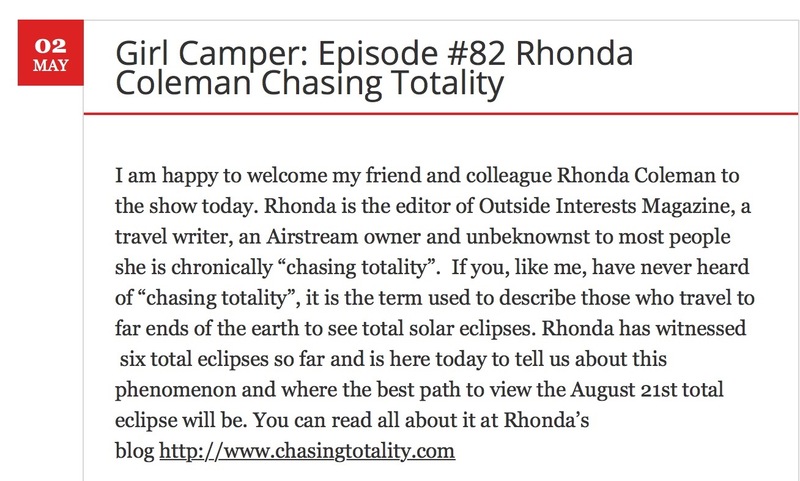 (The sound effects coming from those around you will alert you that totality has occurred.) Rest assured that you’ll get a good long look at the ring and the beads in reverse order at Third Contact. Don’t risk blurry eyesight during the big event by removing your shades too soon. It’s optimal if there’s a coach in the area to let you know what to do. 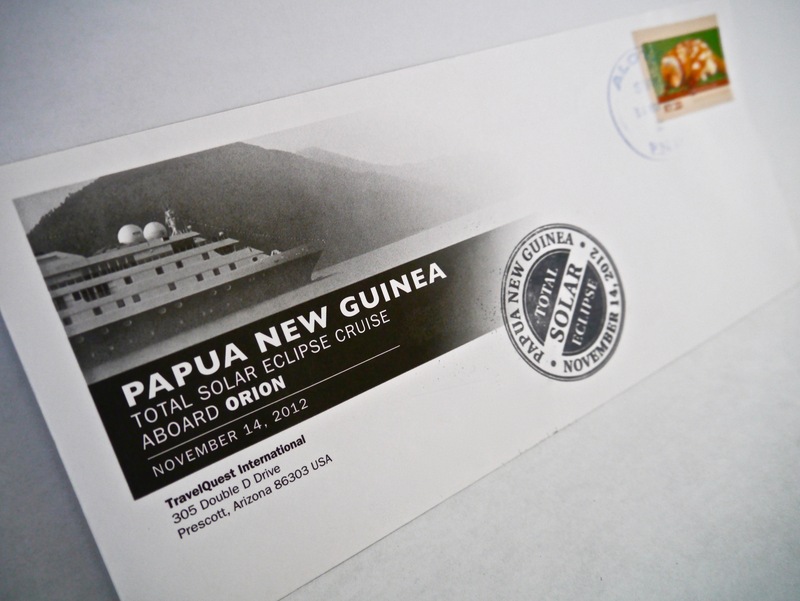 This video is an example of the phenomena countdown by Jay Anderson, meteorologist aboard the expedition ship Orion in the Great Barrier Reef with (TravelQuest, Nov. 13, 2012). Some find spoken words distracting, but I think it adds to the thrill. 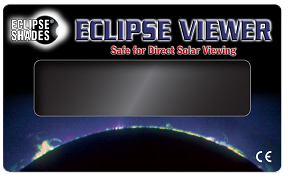 I love looking at the eclipse safety posters and flyers that local governments distribute—like the ones at the end of this post. 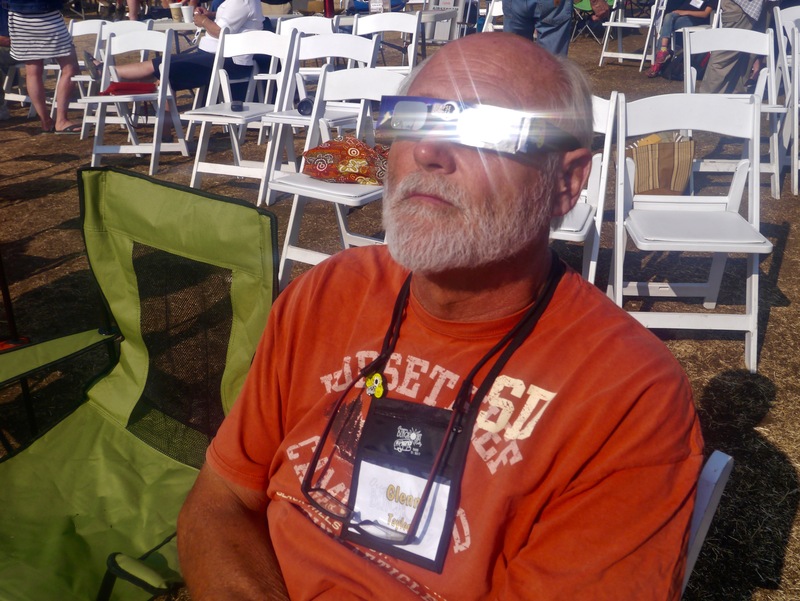 The only safe way to look directly at the partially eclipsed sun is through special purpose filters such as “eclipse glasses” or my uber-dorky #14 welder’s goggles. 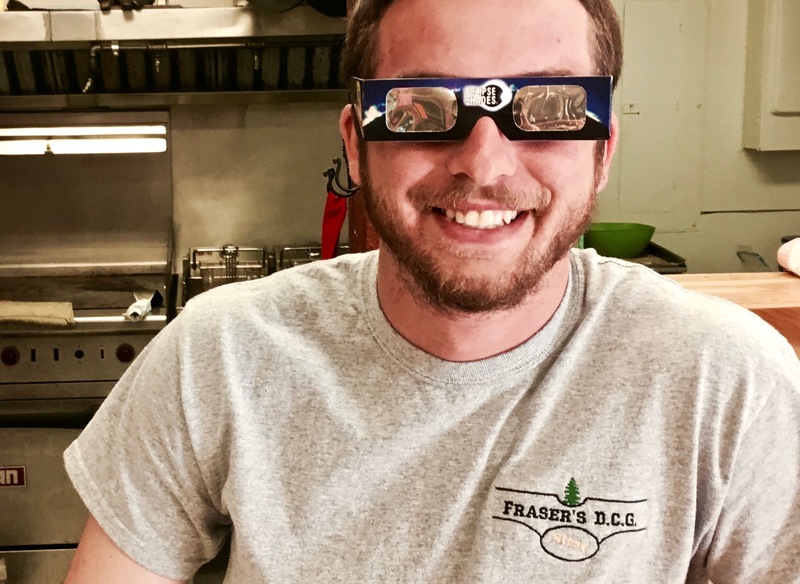 The popular paper eclipse glasses you’ve seen are made with optical density 5 “black polymer” material that filters out harmful ultra-violet, infrared, and intense visible light. Look for brands made in the USA (beware of overseas knock-offs) and that state they are CE certified and meet ISO standards. I recommend Rainbow Symphony, manufacturer of our custom Blackout Rally shades. I’m told American Paper Optics and Thousand Oaks Optical are two other reliable manufacturers. What’s true for your eyeballs is true for the devices you look through. 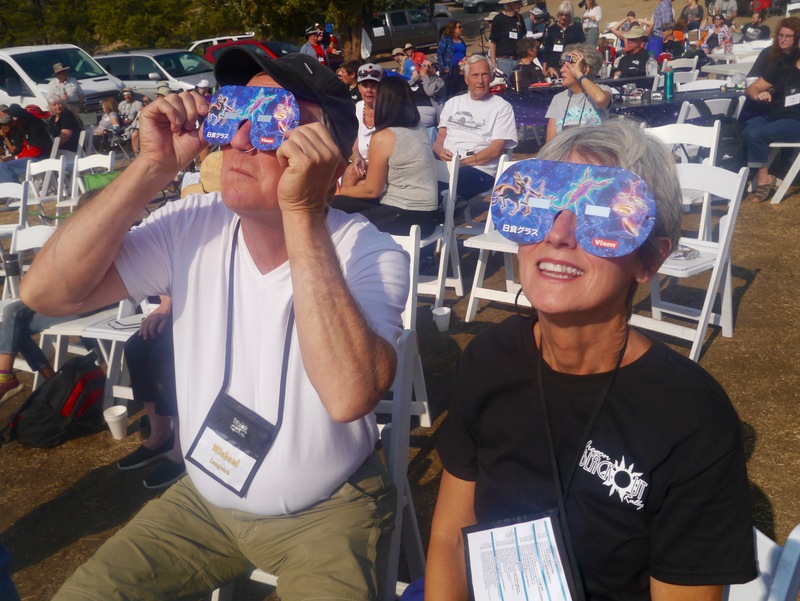 Do not look at the uneclipsed or partially eclipsed sun through an unprotected camera, telescope, or binoculars—and don’t use these things while wearing your eclipse shades, either. 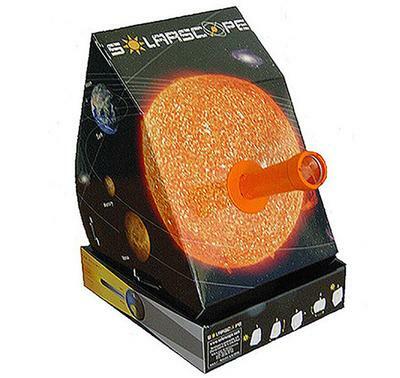 The intensified solar rays will damage the filter and enter your eye. (Gad, this is getting scarier and scarier, isn’t it? 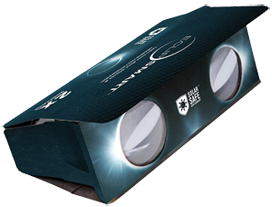 You’’ll be happy to know that your own prescription eyeglasses are safe to use with eclipse shades or a solar-filtered telescope.) Both your eyes and your optical device need their own filter. 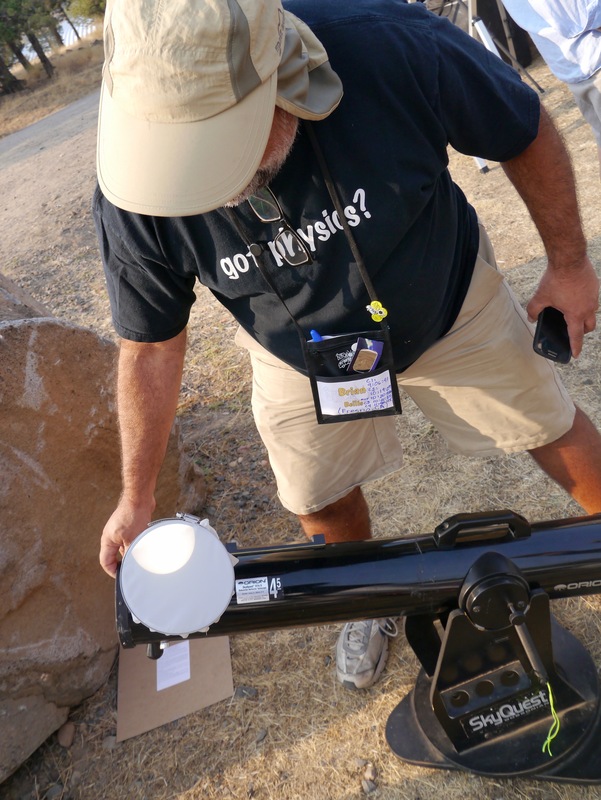 Pointing an unprotected telescope directly at the sun can also result in the unfortunate melting of the plastic parts that hold the internal instruments together. Oh, and don’t make your own filter like some hillbilly. Black plastic trash bags, balloons, camera film (WTF is that), or three pairs of sunglasses worn together won’t bar ultraviolet light. 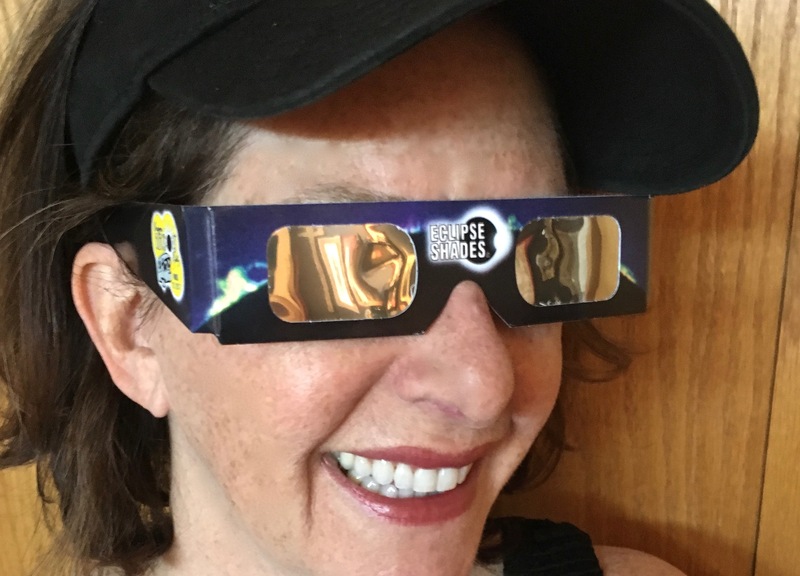 Eclipse shades make a great souvenir of the experience; I have a small collection and the ones from Egypt are my favorite. 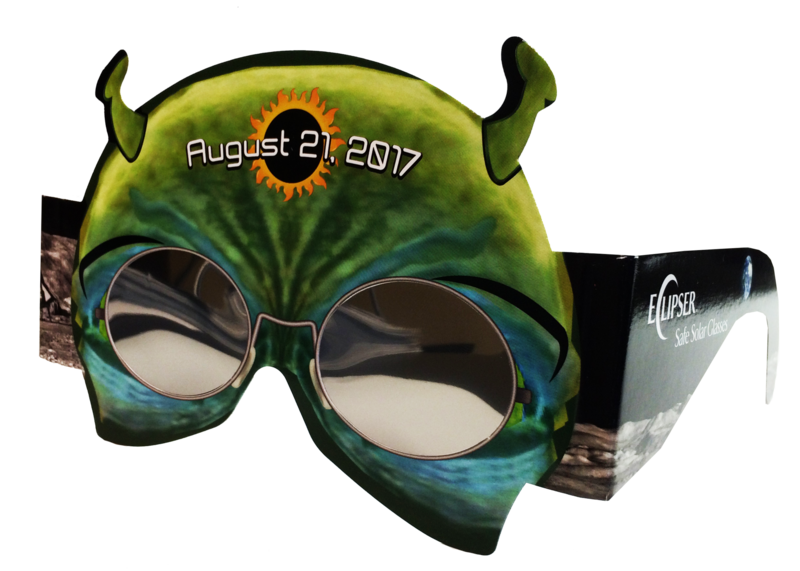 You’ll be able to put your hands on a pair of eclipse shades pretty easily before August 21, but order online soon. 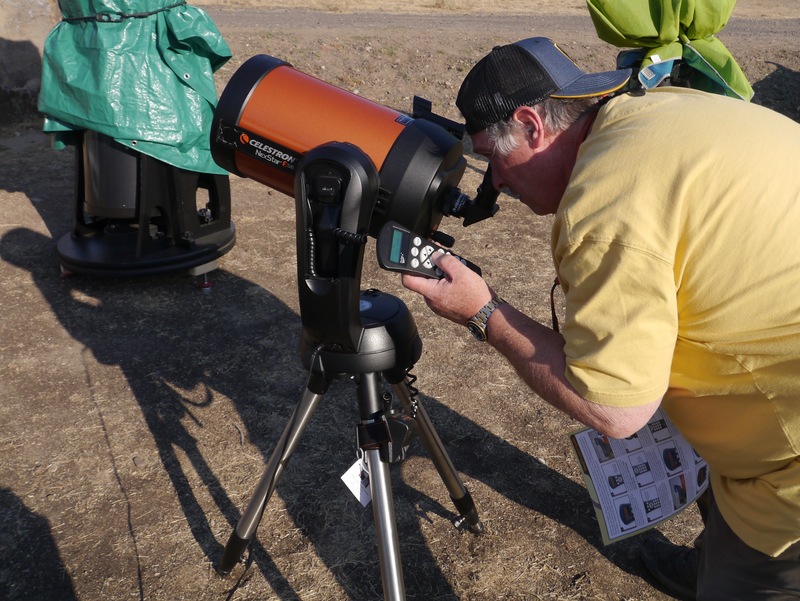 Alternatives to the standard style include hand-held viewers, magnification viewers (like the Celestron EclipSmart™ power viewer) and even wacky ones that let you look like an astronaut or an alien. 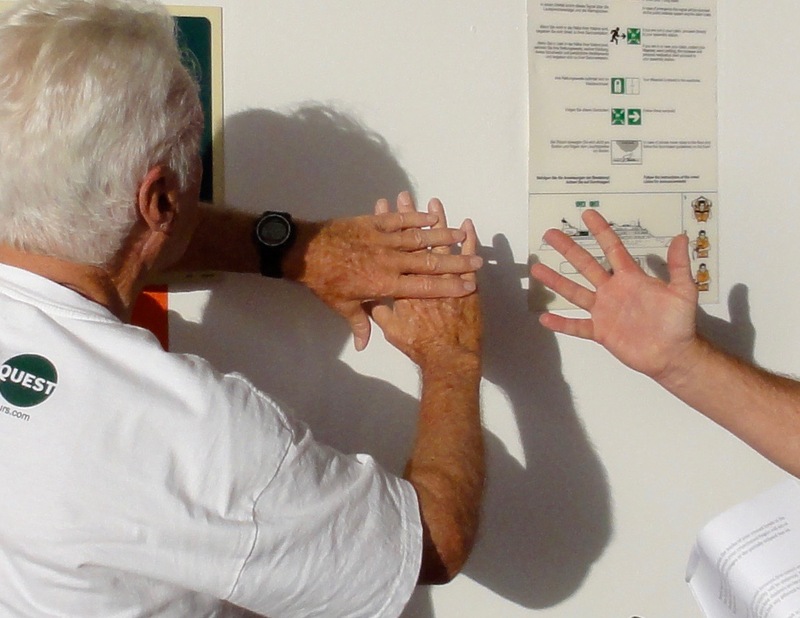 Stand with your back to the sun, and hold up the paper with the hole. The second sheet of paper serves as a screen for the projected image. Do you see a little crescent shadow? That’s the inverted image of the sun coming through the pinhole. 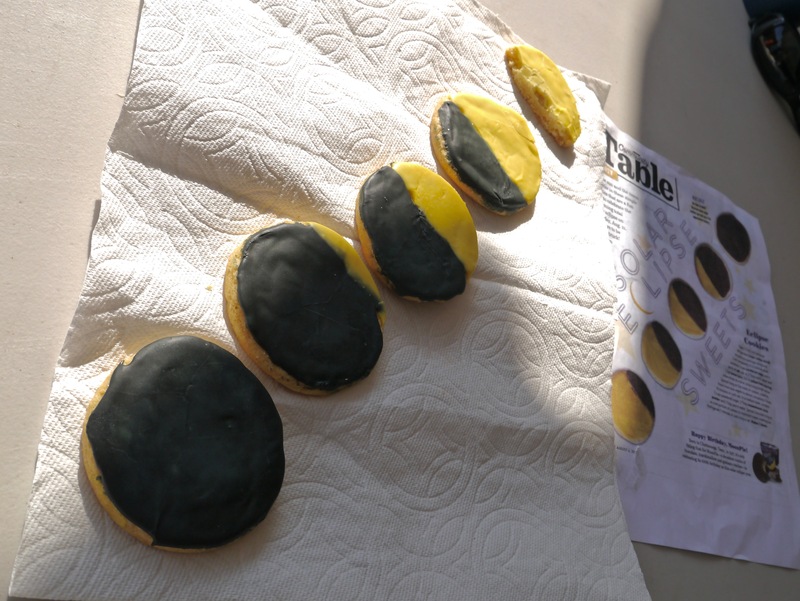 Experiment: make the image of the sun larger by moving the pinhole paper closer to the sun. Anything with “holes” can be a pinhole projector: a straw hat, your loosely crossed hands, etc. Find a nearby tree and look at the ground below: the leaves will create hundreds of crescent projections. 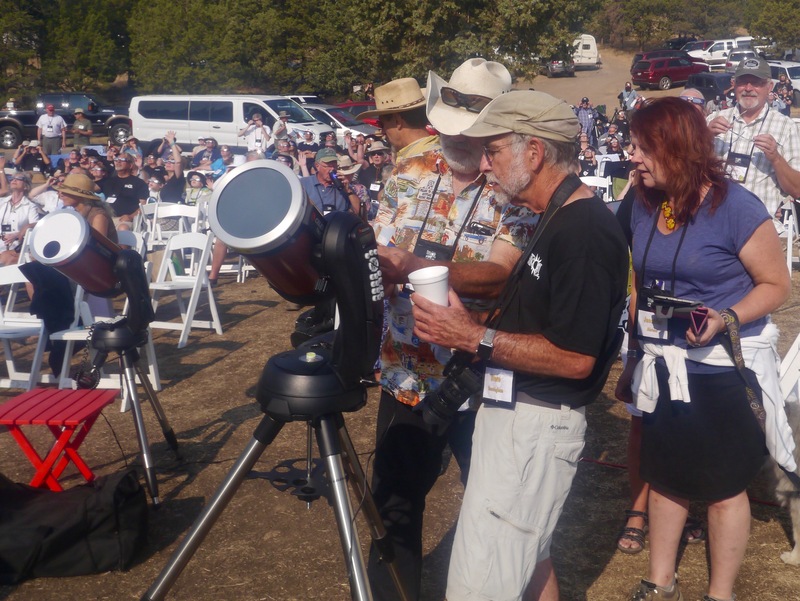 Check out this excellent 4+ minute video courtesy of the American Astronomical Society (AAS) Solar Eclipse Task Force and the American Institute of Physics. 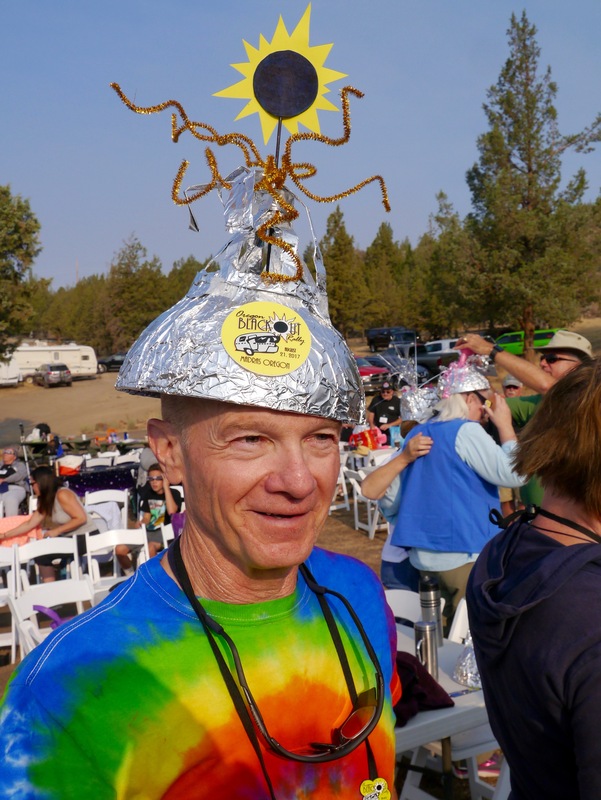 It will tell you everything you need to know about eclipse safety. Above: #14 welder’s glasses. 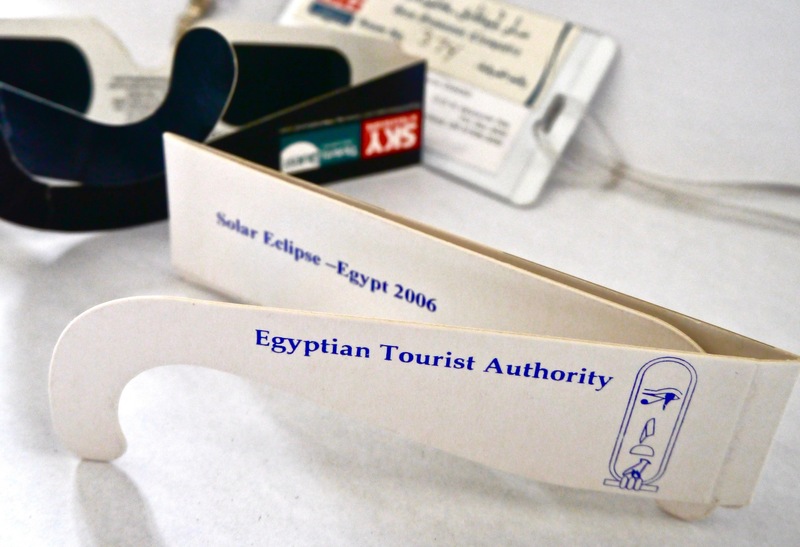 Below: Blackout Rally shades; Egypt souvenir (what does that hieroglyphic say, “scram, tourist”? 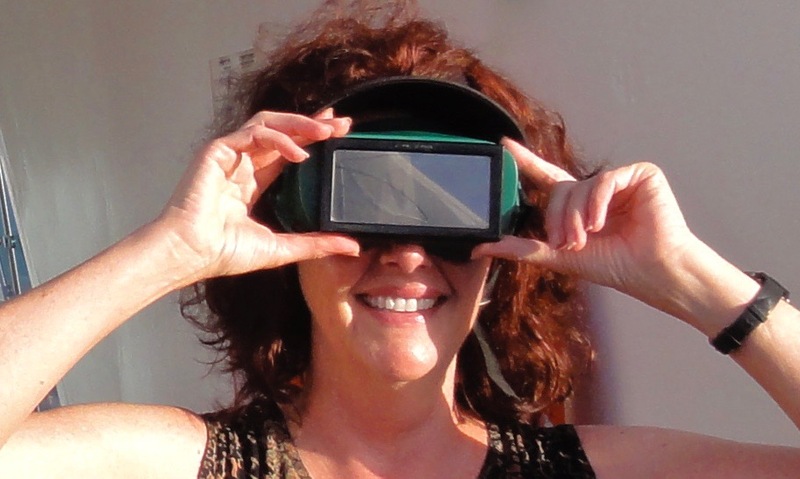 ); handheld viewer, solarscope (I have no idea what this does); PowerViewer; alien shades; pinhole hands. Apoceclipse? Eclipsalypse? 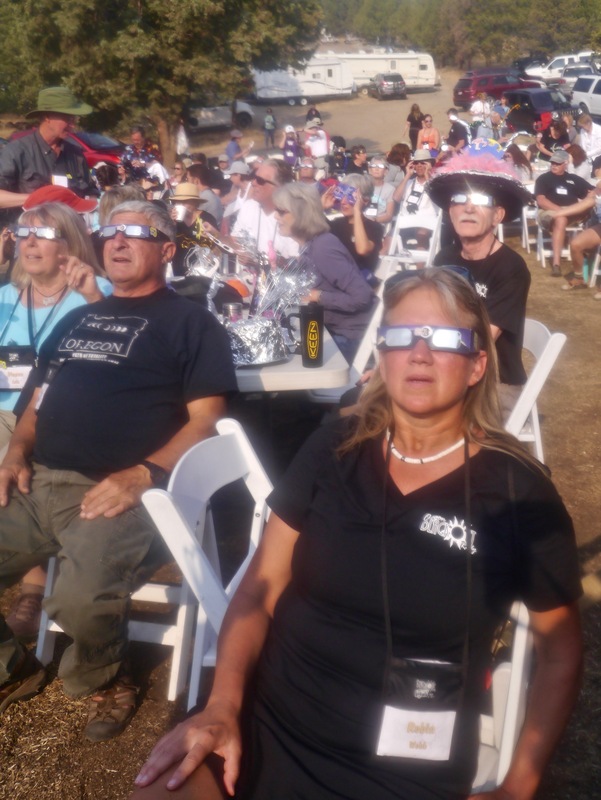 Whatever you call it, Central Oregon is in a wad about The Great American Eclipse, coming soon to a traffic jam near you. 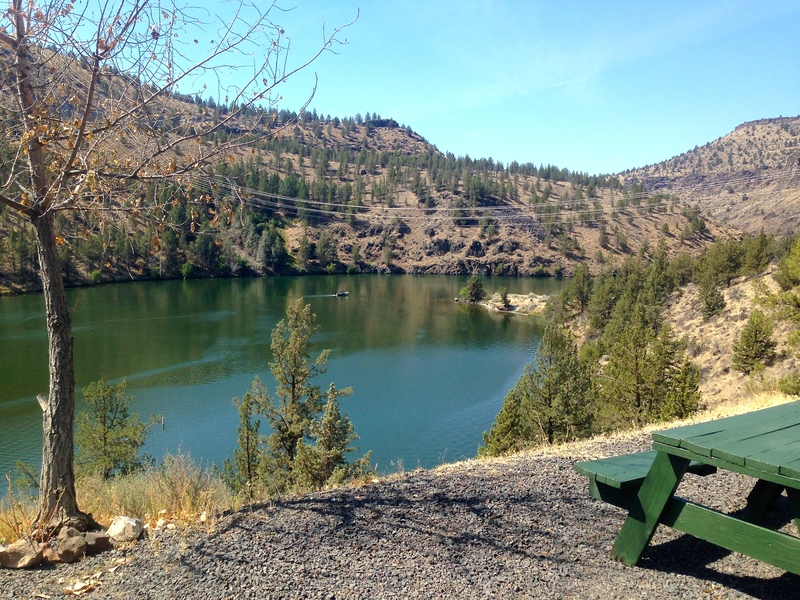 Everyone from the Red Cross to ODOT to the Deschutes County Sheriff to the Unitarian Church are planning for the onslaught of visitors and have been busy issuing advice and warnings. Threat of wildfire is, indeed, the most dire issue. 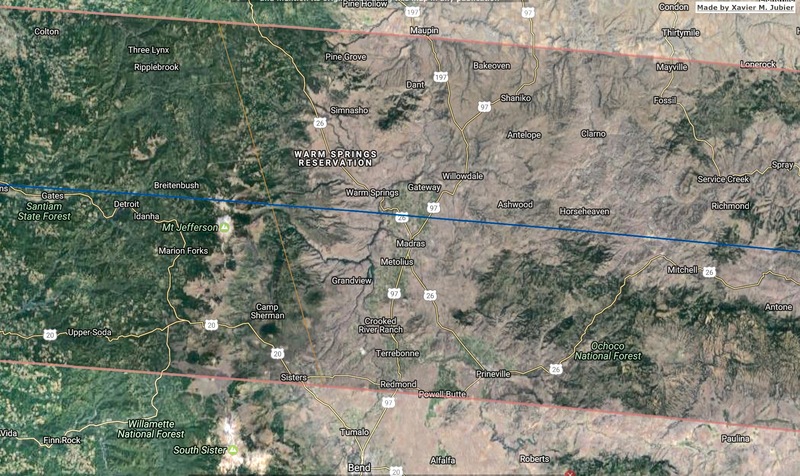 If you’re planning to view totality on the dry side of Oregon, August 14—22 might be a good week to quit cigarettes. To paraphrase Smokey: only you can prevent wildfires. 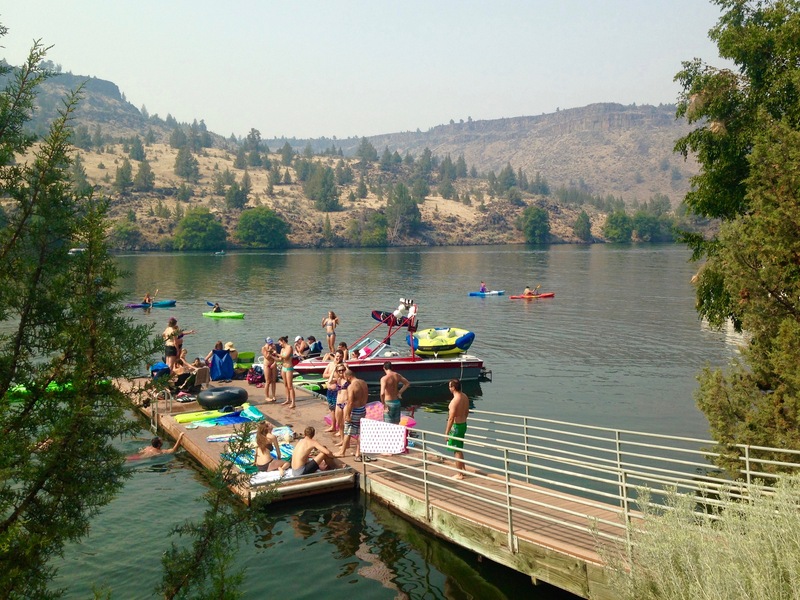 Contact 911, the local fire department, or the Park Service if you notice any unattended or out-of-control fire. Never leave a fire unattended. Completely extinguish the fire by dousing it with water and stirring the ashes until cold. When camping, take care when using and fueling lanterns, stoves, and heaters. Make sure lighting and heating devices are cool before refueling. Avoid spilling flammable liquids, and store fuel away from appliances. Do not discard cigarettes, matches, and smoking materials from moving vehicles. Be certain to completely extinguish cigarettes before disposing of them. And for chrissakes, don’t burn any trash or brush this summer. 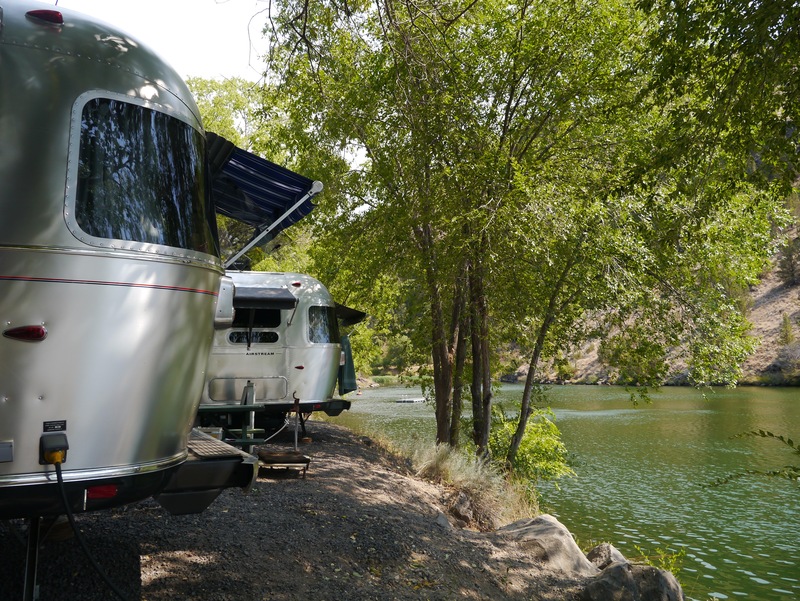 Also, be careful with anything that could cause a spark; last year, a motorhome towing a small utility trailer created a significant fire by Highway 26 when the trailer—unseen by the driver—bounced and threw off sparks that ignited the dry grass on the side of the road. Get grocery shopping done a week or more ahead of time—not only to beat the crowd, but to give stores time to restock. Pick up prescriptions and medical supplies early. 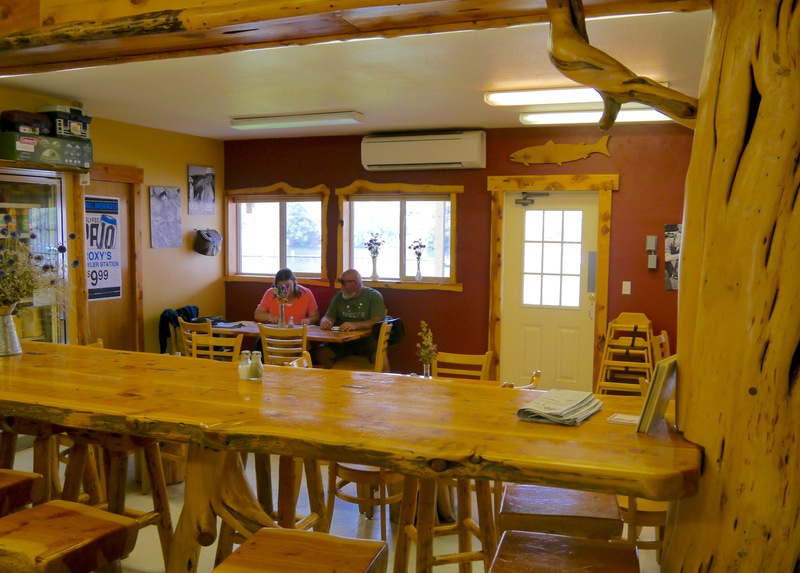 Get doctor and dental appointments out of the way. Conserve energy: unplug appliances that aren’t in use; do laundry and run the dishwasher during off-peak hours. Be prepared for slow internets, and streaming may be sluggish or nonexistent. Fill up gas tanks early. 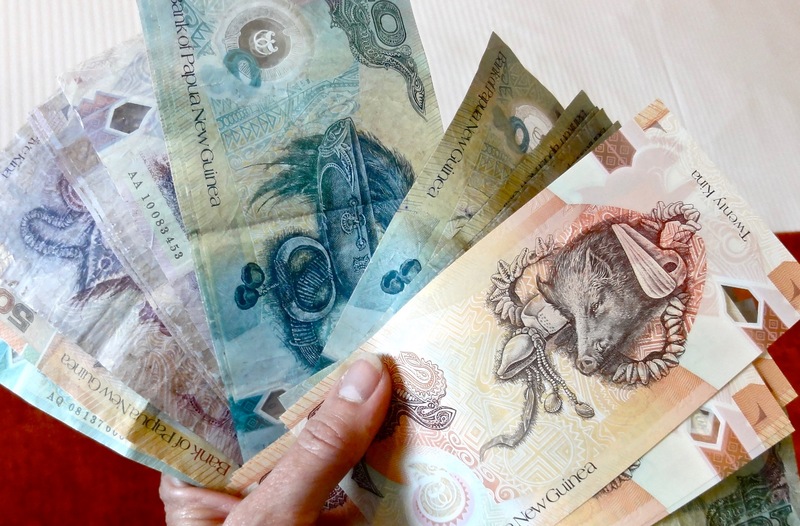 Get cash early; ATMs may run out of bills or be hindered by the aforementioned slow connectivity. Overall, supplies will be limited and in high demand, traffic will be heavy, and lines at restaurants and in stores will be long—so exercise patience. Be nice, you’re in Oregon! More on the subject in The Source Weekly. 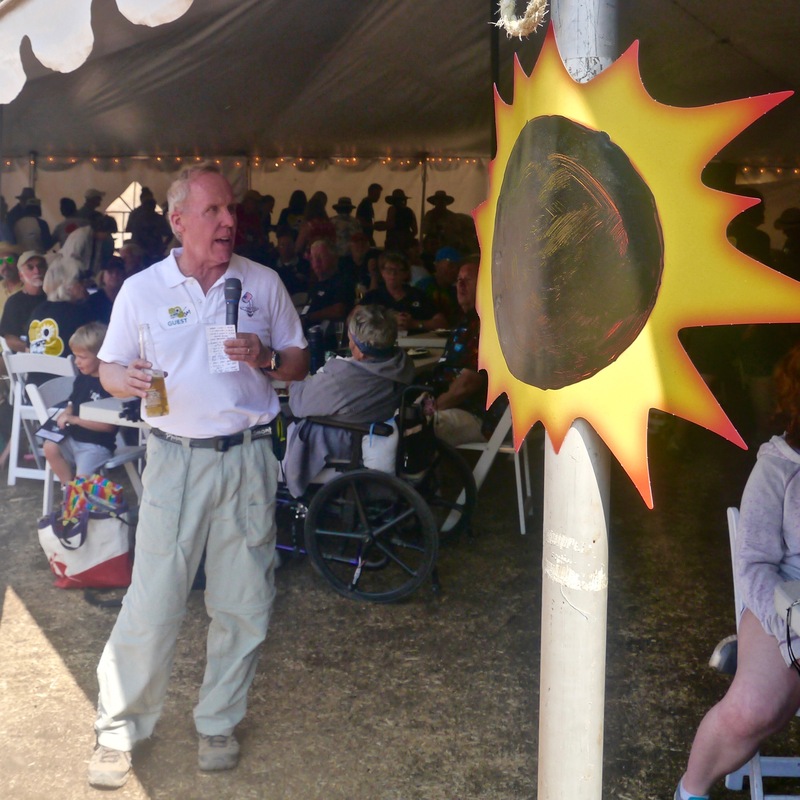 I had fun sharing my eclipse experiences with a couple of good interviewers. 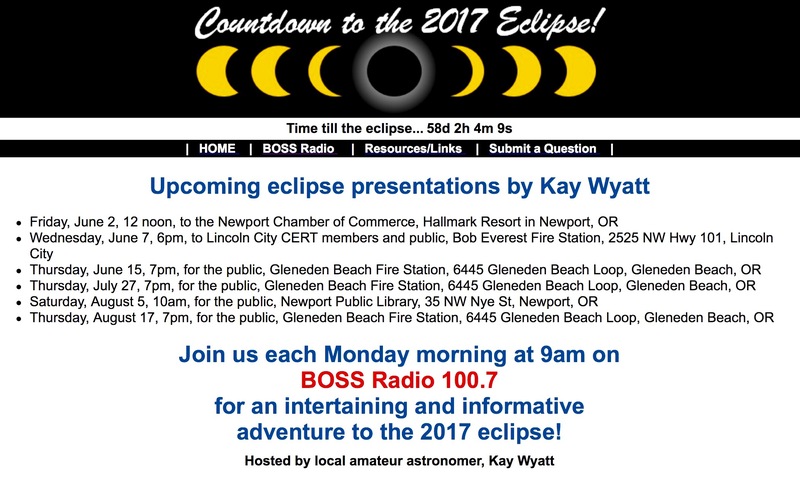 Host of the weekly talk show, Kay Wyatt, is an astronomer who has her very own observatory north of Lincoln City in the coastal mountains. I was honored to be part of the 17-episode program that included interviews with several notable astronomy stars (pun intended)—among them, Fred Espenak (“Mr. 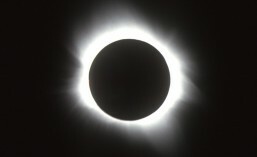 Eclipse”) who was recently honored as the astrophotographer whose image was used to make the USPS Total Eclipse stamp. 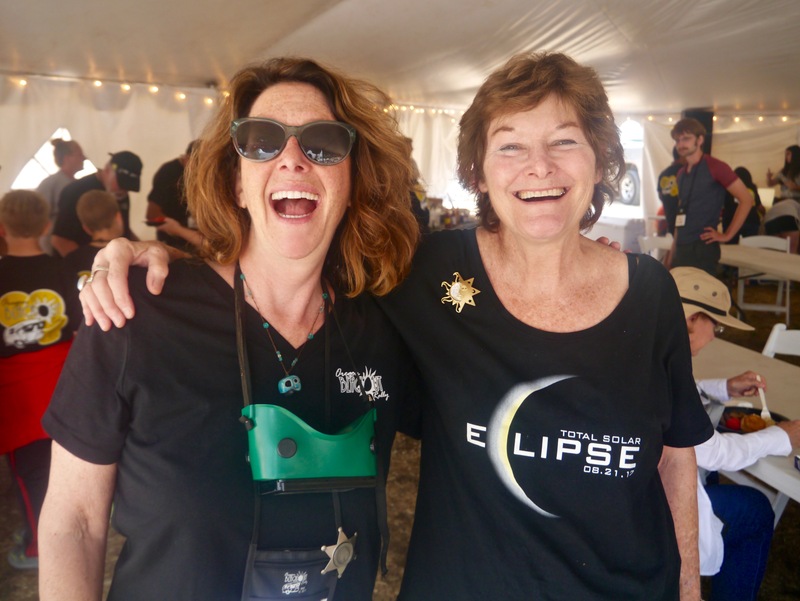 I also spoke with bubbly Janine Pettit, host of the Girl Camper podcast —as Airstream trailering and eclipse chasing will soon overlap at the Oregon Blackout Rally in August—and with the Technology Reporter for the Bend Bulletin. 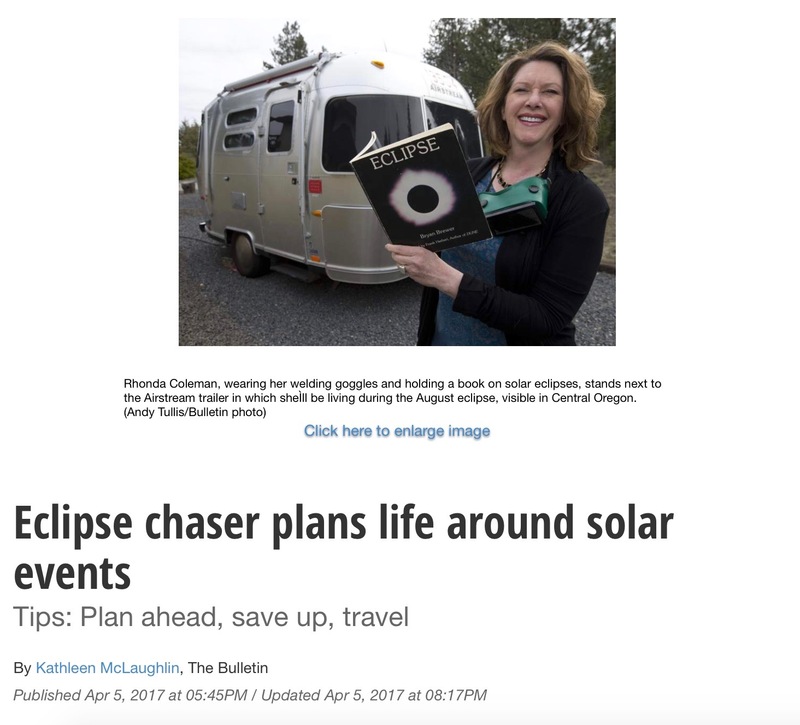 “Eclipse Chaser Plans Life Around Solar Events” is actually a pretty accurate headline. Update: I recently enjoyed a conversation with Brian Resnick, a reporter for Vox who interviewed several chasers for this fun and informative article. 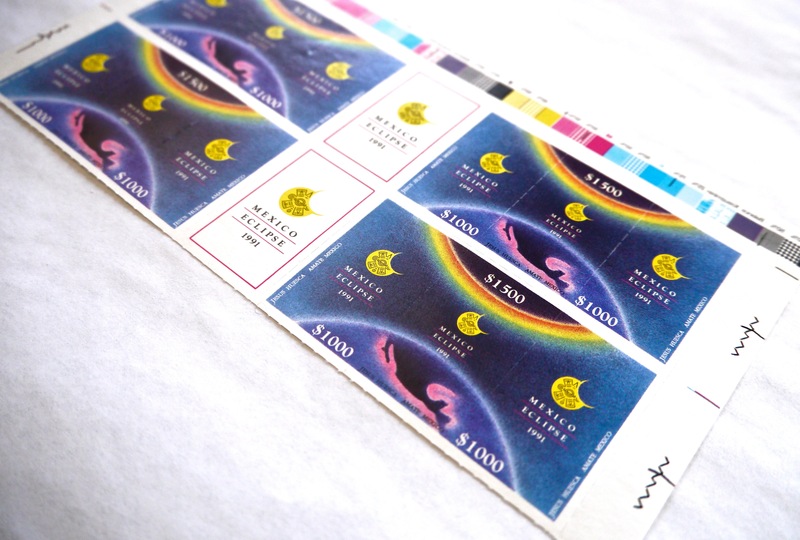 Eclipse chasers who also collect stamps. If that isn’t a double nerd alert, what is? Where my philatellas at, yo? 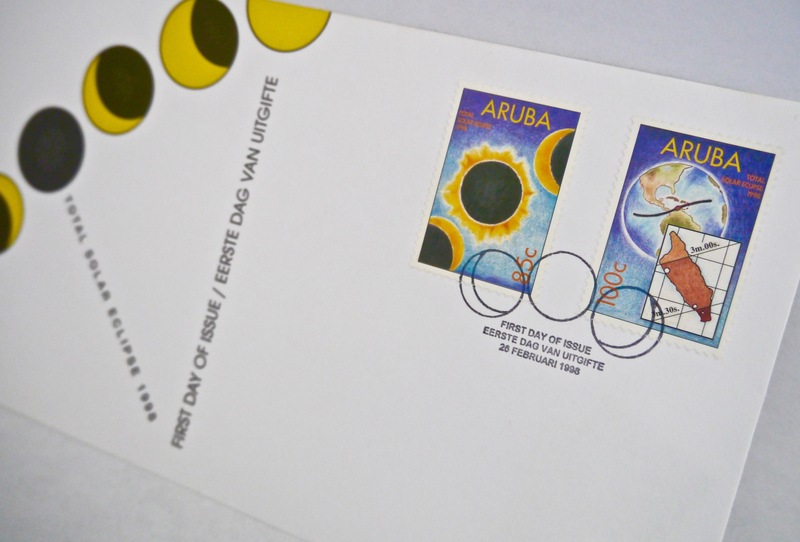 Stamps and first day covers from each eclipse make a fabulous (and flat, lightweight) souvenir. 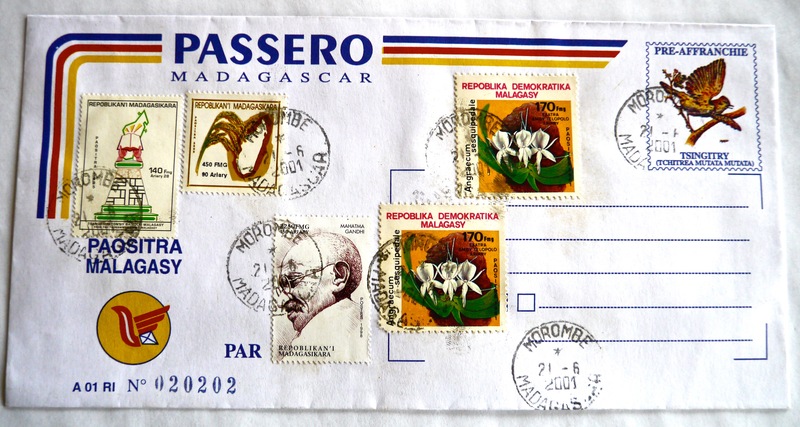 To celebrate a special TSE, local governments often issue a commemorative stamp and/or a first day cover—an envelope affixed with said stamp, postmarked on the first day of its issue, usually imprinted with some kind of illustration. 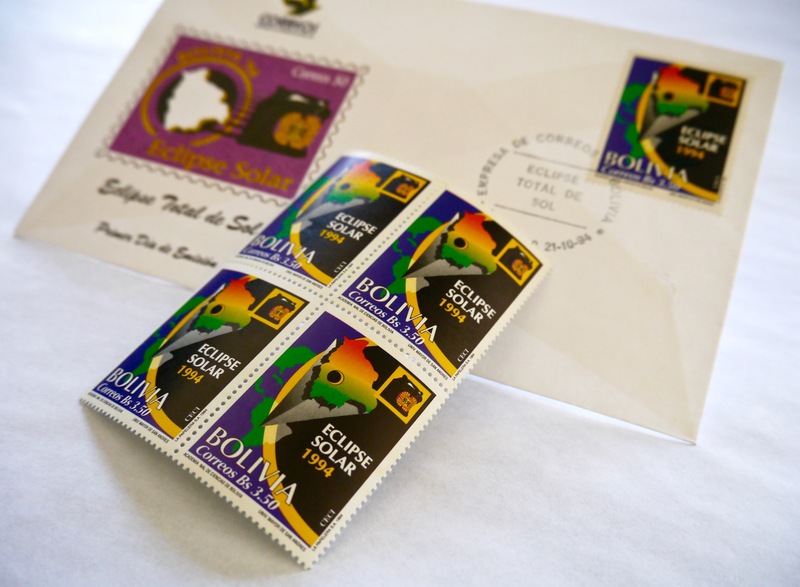 Today the USPS released their Total Eclipse of the Sun Forever stamp, a first-of-its-kind stamp that transforms the eclipsed sun into an image of the Moon using thermochromic ink. 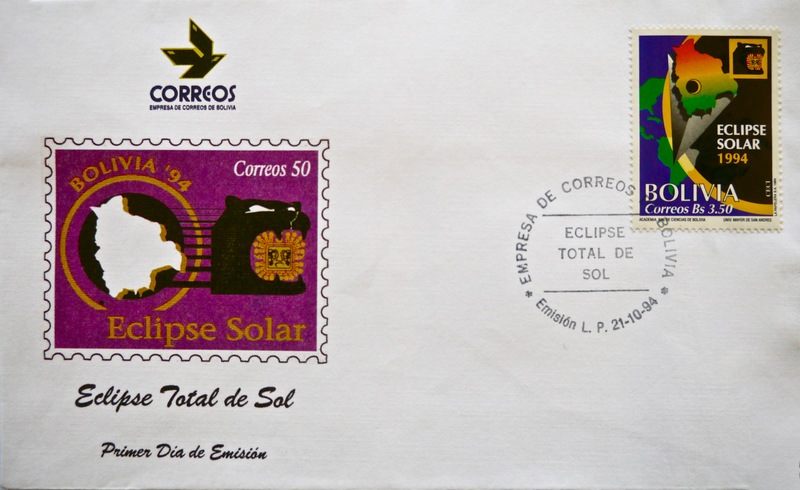 Make your own philatelic souvenir for the Great American Eclipse: address an envelope to yourself, place a Total Eclipse of the Sun Forever stamp in the usual corner, take it to the post office on the morning of August 21, 2017, and ask a clerk to date stamp the envelope and drop it in their outgoing mail. (Add artwork on the lefthand side for a personal touch; kid’s drawings of their interpretation of the eclipse would be adorable.) Be sure to physically perform this transaction with a postal clerk; you might miss the postmark by a day if you drop it in a mailbox. 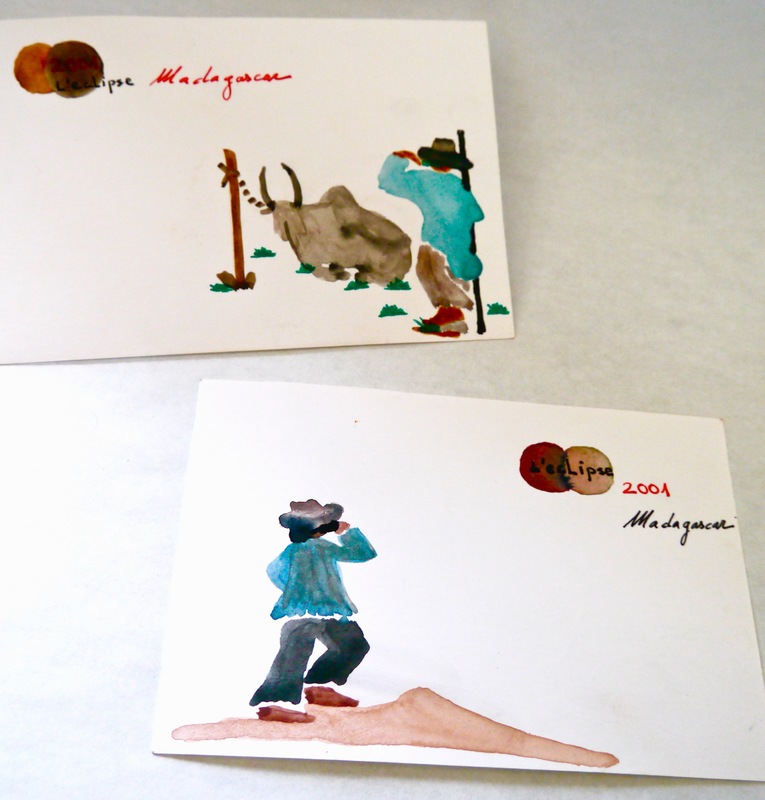 Above: Stamps and cover from Bolivia, 1994. 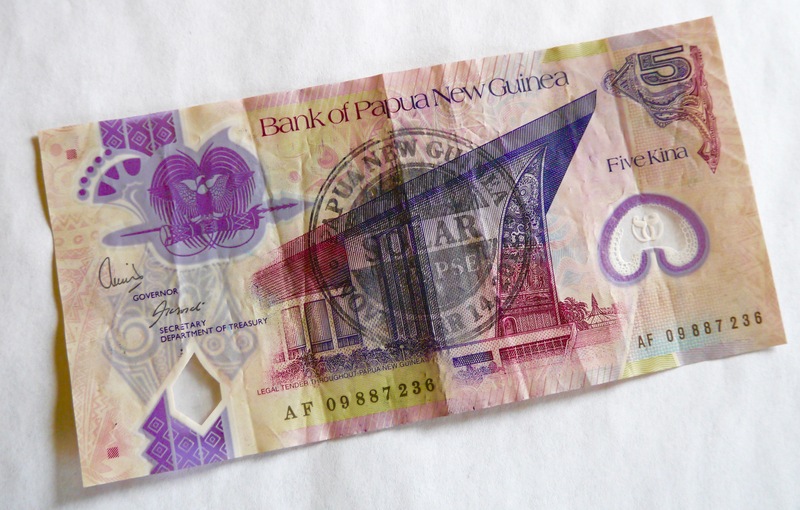 Below: Another from Bolivia; Mexico 1991; Aruba 1998; Madagascar stamps and handmade card 2001; souvenirs from Papua New Guinea 2012 (Orion ship stationery and kina bills—folding money is fun to collect, too).